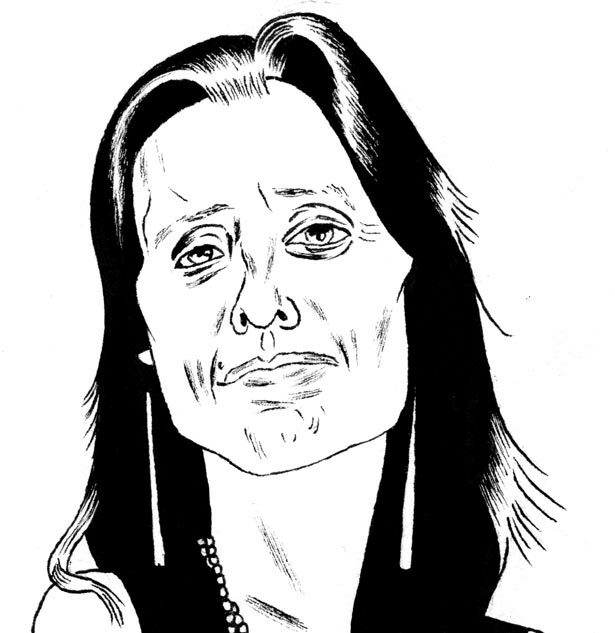 Winona LaDuke, a member of the Anishinaabe nation from the White Earth Reservation in Minnesota, is renowned for her activism on behalf of women, indigenous people and the environment. The two-time Green Party vice presidential candidate and co-founder of Honor the Earth is now on the front lines of the climate fight. We spoke in North Dakota in May. Laura Flanders: This April, you joined a group of ranchers, farmers and tribal members from along the route of the Keystone XL pipeline who set up a “Reject and Protect” encampment near the White House. Why? Winona LaDuke: I live at the headwaters of the Mississippi and Red rivers, and I kept hearing about these pipelines. I don’t oppose pipelines—I like infrastructure—but I heard that the Keystone XL pipeline was going to carry tar sands oil from the lands of the Cree and Dene all the way to the Gulf of Mexico across the Ogallala aquifer, one of the largest aquifer systems in the world. It’s bad for the climate, bad for the people, and it’s all about profits. The risk is on the people who live in the middle, and the profits are at the beginning and the end. LF: Now you’ve come to North Dakota. What have you seen? WL: I see a lot of damage to Mother Earth. I see water being taken from creeks where water belongs to animals, not to oil companies. I see toxics by the side of the road. I see a lot of flares; I see a lot of big trucks. I see a community where oil has made some very rich and many stayed just as poor as they were, where two to three families live in a house. Meth and heroin have come in. The level of violence is increasing. LF: A large part of the drilling is taking place on tribal land. Whom do you hold responsible? WL: The present perpetrators are the oil companies. The historic perpetrator was the United States government. These people here, these are survivors. They are the people who took care of Lewis and Clark and were repaid by having their beautiful territory named after a fort. Conditions have been very, very bad. Last winter, Debbie Dogskin died on the Standing Rock reservation because she ran out of propane, less than a hundred miles from the Bakken oil field. Now an oil boom is creating a natural sacrifice area with a level of ecological destruction and human misery that is going to be out here in twenty years. The state of North Dakota doesn’t care. They like the money that’s up here now. They just close their eyes. LF: What are the alternatives? WL: One hundred and fifty years ago, the land provided well for those who lived on it. On my reservation, we had one of the most abundant fisheries in the world and hundreds of thousands of acres of wild rice beds. We’ve lost a lot of it, but there’s still natural wealth that could support our communities. On my reservation, we have five wind turbines now. We have solar thermal panels on some houses. We’re going to put ten more up over the summer. We grow a lot of really old corn varieties, with twice the protein and half the calories. I’m interested in what kind of food we’re going to eat as the climate changes. I’m interested in what kind of economy we’re going to have in another 1,000 years. We could be working on that now, but not if we’re polluting our water and our land in ways that will require remediation for decades to come.